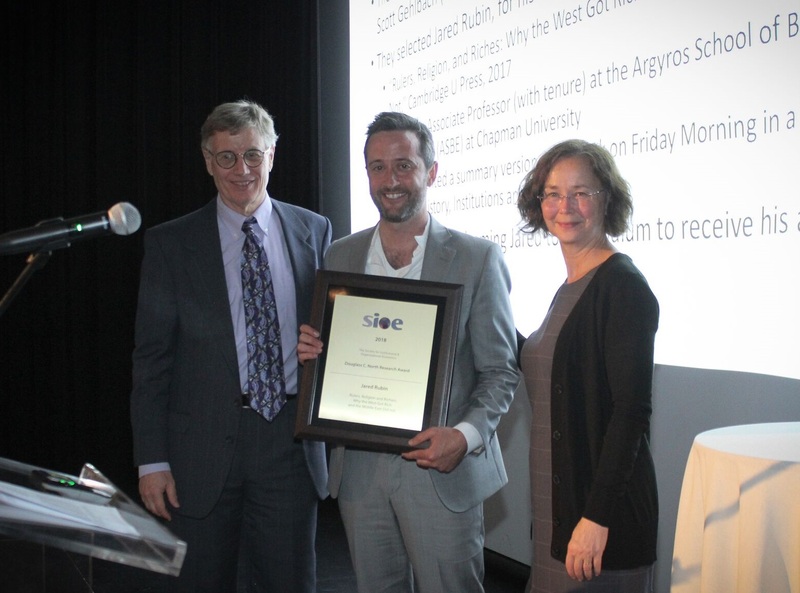 The Douglass C. North Research Award, given for the best book in institutional and organizational economics published in the previous two years, goes to "Rulers, Religion, and Riches: Why the West Got Rich and the Middle East Did Not," by Jared Rubin. This outstanding monograph addresses one of the core questions in institutional economics: why are some countries rich and others poor? The answer, writes Rubin, has much to do with the relationship between religious and political authorities. Political leaders rely upon “propagating agents” to remain in power. Among these are religious authorities, who provide legitimacy to rulers—but at a price. Both Christian and Islamic texts contain ideas that are inimical to modern economic development. Historical legacies imply that these ideas formed the basis of exchange between rulers and clerics to a greater degree in the Middle East than in the West. This tendency only increased after the invention of the printing press, which served to further undermine religious legitimacy in Reformation Europe, even as the press was banned in the Ottoman Empire. The consequence was a widening gap in economic development that persists to this day. Tightly argued and beautifully written, "Rulers, Religion, and Riches" is an outstanding exemplar of the work inspired by Douglass North and a worthy recipient of the award that bears his name.